The building in which a man's body was found had been padlocked after it was reported as being insecure, Aberdeen City Council has told BBC Scotland. Michael Stewart's body is believed to have lain in the flat in Balnagask Avenue for a number of weeks before he was discovered. The death of the 32-year-old is not being treated as suspicious. 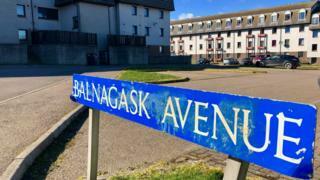 The council said procedures relating to securing properties that are believed to be vacant would be updated. It has not yet confirmed whether the property was checked before its external door was locked. Mr Stewart's body was found on 8 March when police broke into the building after his family reported him missing. A spokesman for Aberdeen City Council said it had spoken to Mr Stewart's family and was supporting the police investigation.